Bilbao (Spain) will host the 5th edition of Graphene Conference series, the largest European Event in Graphene and 2D Materials, from the 10th until the 13th of March 2015 at Bilbao Exhibition Centre. The last edition, Graphene 2014, attracted 800 participants from 49 countries. For the 1st time there was an exhibition of Worldwide graphene research centers, apart from graphene producers, publishers, manufacturing equipment makers, graphene application developers, networks, and many others. On this edition 35 booths and 3 pavilions were featured with roughly 85 exhibitors represented. Following the overwhelming success of the last four editions of Graphene, Phantoms Foundation is pleased to announce the fifth edition between the 10th and the 13th of March 2015 in Bilbao (Spain). 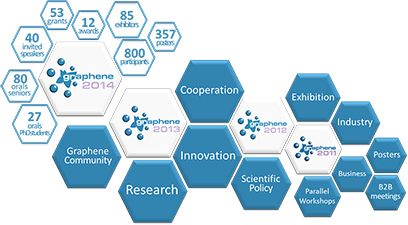 Graphene 2015 will be organized within ImagineNano event and in parallel with 5 conferences. Exhibition and sponsorship opportunities available. First come, first served basis.